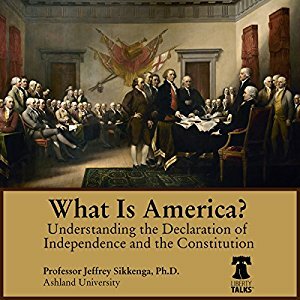 What Is America Understanding the Declaration of Independence and the Constitution [Audiobook] | Free eBooks Download - EBOOKEE! Jeffrey Sikkenga (Author, Narrator),? "What Is America? : Understanding the Declaration of Independence and the Constitution"
More than ever, Americans are reclaiming our national identity based on the fundamental principles of America's founding. In this enlightening course, you will explore what defines us as Americans by looking at our founding documents: The Declaration of Independence and the Constitution. This is the course you always wish you had taken when you were an undergrad. An engaging and gifted teacher, Professor Jeffrey Sikkenga (PhD, University of Toronto) passionately explores the founding principles that make America a great nation. In his 18 lively, erudite lectures, you will discover fresh insights into the history of the founding documents. Under Professor Sikkenga's expert guidance, you will understand the Declaration and Constitution as never before. You will explore vital questions: How and why were the critical sections written? What principles do they enshrine and how do these principles define the limits of government and the rights and freedoms that make us American? In a time when the limits of government power and individual freedoms are being tested, it is essential to understand how our founding fathers meant for these documents to steer a right path towards freedom and prosperity. Join Professor Sikkenga, Associate Professor at Ashland University, in exploring the rights and freedoms that the founding fathers bequeathed to us in the Declaration of Independence and the Constitution. No comments for "What Is America Understanding the Declaration of Independence and the Constitution [Audiobook]".